Within the European Space Agency, CubeSats are now being used for technology in-orbit demonstration and distributed CubeSat systems in Earth orbit are being studied for Earth applications such as remote sensing and telecommunications. 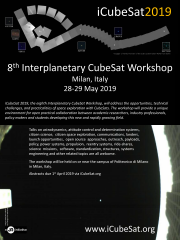 As a further step, CubeSats are being considered as a potential platform to carry out experiments related to Astrobiology and Astrochemistry beyond LEO, for example in highly eccentric Earth orbits and potentially further by piggybacking on available launch opportunities. Technology developments supporting such mission scenarios target both the payload and platform aspects for such missions. For the payload, this includes the development of a miniaturised IR spectrometer to track the chemical signatures of specimen subjected to space radiation environment beyond LEO and the development of a miniaturized life support system for e.g. mammalian cells. For the platform, a high rate payload data transmitter and attitude sensors suitable for such orbits are under development. One of the risks to be addressed are the radiation effects on CubeSat COTS modules in orbits above LEO. Ground based test facilities will support the characterization of their radiation hardness. Miniaturised electric propulsion systems are under development which may in the future allow larger CubeSats to reach deep space from e.g. GTO piggyback launch opportunities. On the other hand Cubesats will be used for Astrochemistry experiments on board the ISS as an external payload. For instance, the OREOcube experiment investigates the photochemical stability of organic compounds in simulated environments and in contact with inorganic subtrates. OREOcube adopts cubesat technology from its predecessor O/OREOS, a successful NASA nano satellite, and hitchhikes on the ISS to perform exposure experiments with the advantage of combining in-situ analysis and samples return.